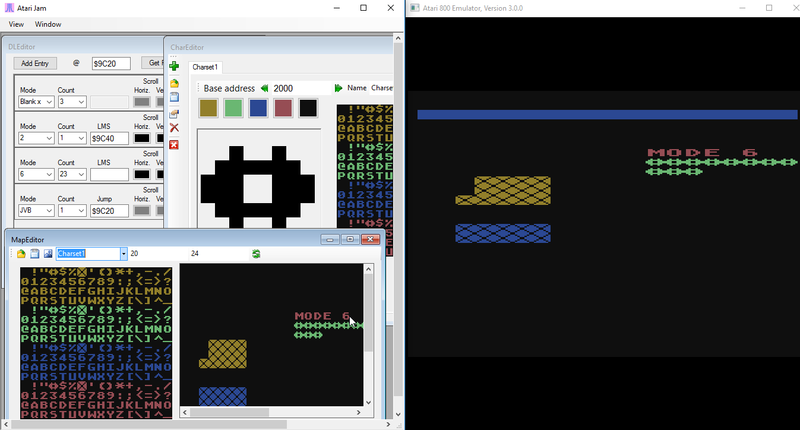 Atari Jam is a Windows tool for developing Atari 8-bit computer software. The theoretical concept is that it is a PBI device that maps the memory, allowing an external device to monitor and change things in real-time. In practice, this is accomplished by attaching to an external emulator and accessing the RAM. The program gives the user a suite of tools to interactively modify, tweak, test and program software. It is not intended to be a replacement for a development IDE but rather to let the user experiment and rapidly develop small projects or pieces of something larger. It currently compatible with an Atari 800XL with 64K of RAM. The video player is very limited in the input it will accept. It uses a dither pattern that will be applied each frame, using the current palette. The user can adjust colors to find the best match. 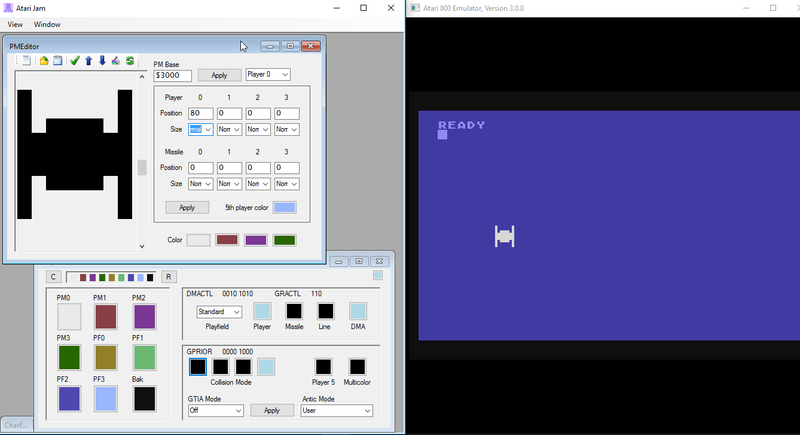 The program monitors GRACTL and PM registers through the addition of an OS patch that removes shadowing for the paddles. This patch slightly reduces the cycles used by the OS during a refresh. Hopefully, this is something people will find useful. I plan to have a version ready to try by March 1st. Edited by lightman, Sun Jan 15, 2017 8:04 PM. This is excellent! I would be happy to alpha/beta test it before March! is this to be used as/with a rom/ram simulator through the pbi? Edited by _The Doctor__, Sat Feb 4, 2017 8:03 PM. Great! Maybe you could send me a message and we'll work out a simple plan for you to test it out. I've used it in a couple projects so far and definitely miss it when I don't have it. Ultimately, some kind of PBI connection would be the goal. The software just needs access to the RAM. 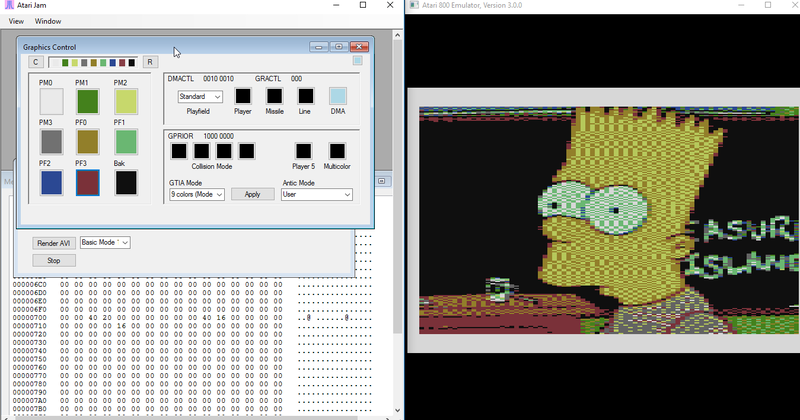 Right now, this is being done by accessing the computer's RAM in emulation. It would be nice to emulate the theoretical device and even implement it into an FPGA. Using the PBI, it might also be possible to track all memory-based I/O, which would be even better. 1. To remove my assembler and use xasm, instead. I don't really want to write an assembler, so there may be a reasonable way to spawn xasm and then load the result into RAM. That would make it effectively the same as my current implementation, minus the bugs. 2. Implement some kind of scripting engine. I've considered making some kind of scripting/BASIC interface, to improve non-native development. I've talked a bit with popmilo and that might be a place our projects intersect. Hopefully, we can pool resources there and make something really cool. I haven't heard back from OxC0FFEE and it would be nice to have a beta-tester. Anyone want to take some time to try the program out and provide feedback? Not to resurrect an old thread, but has there been any updates to the status of this project? This looks very interesting! Hi! I'm planning to release a version in a couple weeks. It would be nice to get your feedback on the software and how I can improve it. 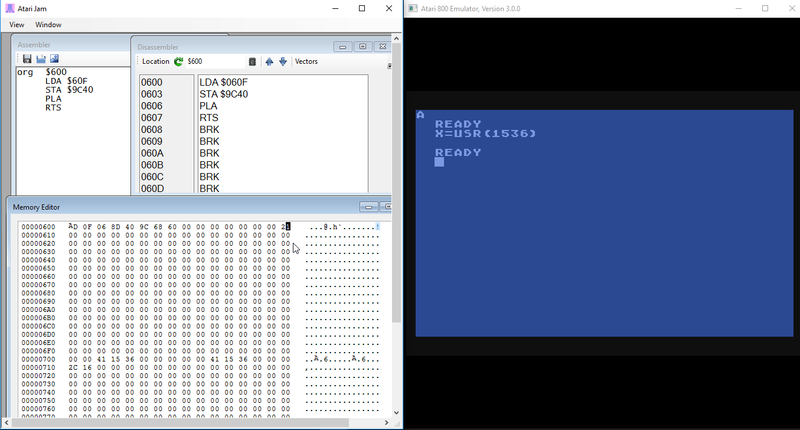 I recommend using Atari800 with it but I've been working on Altirra integration. The way Altirra does the memory map is less straight-forward, unfortunately. This is why beta testers who really do some coding etc are needed.... when doing this sort of thing it takes a decent swath of folks to shake it down and help it to be successful. Awesome! I've got my 800xl set up already for whenever you want some extra eyes on it!